Eton mess is a traditional English dessert consisting of a mixture of strawberries, broken meringue, and whipped heavy cream. First mentioned in print in 1893, it is commonly believed to originate from Eton College and is served at the annual cricket match against the pupils of Harrow School. 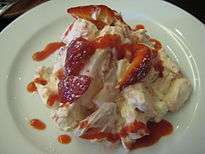 Eton mess was served in the 1930s in the school's "sock shop" (tuck shop), and was originally made with either strawberries or bananas mixed with ice-cream or cream. Meringue was a later addition. An Eton mess can be made with many other types of summer fruit, but strawberries are regarded as more traditional. A similar dessert is Lancing mess (which uses bananas), served throughout the year at Lancing College in West Sussex, England. The word mess may refer to the appearance of the dish, or may be used in the sense of "a quantity of food", particularly "a prepared dish of soft food" or "a mixture of ingredients cooked or eaten together". ↑ Darra Goldstein; Sidney Mintz; Michael Krondl; Laura Mason (2015). The Oxford Companion to Sugar and Sweets. Oxford University Press. pp. 243–. ISBN 978-0-19-931339-6. ↑ Arthur Henry Beavan (1896). Marlborough House and Its Occupants: Present and Past. p. 162. ↑ Weir, Robin; Caroline Liddell; Peter Brears (1995). Recipes from the Dairy. London: National Trust. ISBN 0-7078-0243-1. ↑ Blumenthal, Heston (2005-02-05). "The appliance of science : Another fine mess". The Guardian. 1 2 Blumenthal, Heston (2003-06-28). "No messing". The Guardian. ↑ Smith, Michael (1973). Fine English Cookery. London: Faber and Faber. ISBN 0-571-10349-9. (Revised edition London: Serif, 1998, Foreword by Geraldene Holt; ISBN 978-1897959367.) See Dupleix, Jill (2004-06-03). "Eton mess : Strawberries and cream make a superb summer pudding for lazy, hazy days". London: The Times. ↑ A recipe by Heston Blumenthal, for instance, uses bananas: see Blumenthal, Heston (2006-02-12). "Eton mess : Look, no berries – this Eton mess is a crispy, creamy, zingy heap of a treat". London: The Sunday Times. ↑ "mess". Merriam-Webster Online Dictionary. Retrieved 2007-11-25. The Oxford English Dictionary defines mess as "[a] serving of food; a course; a meal; a prepared dish of a specified kind of food." or "[a] portion or serving of liquid or pulpy food such as milk, broth, porridge, boiled vegetables, etc. ": Simpson, John, ed. (March 2002). "mess, n.". OED Online. Oxford: Oxford University Press. Retrieved 2007-07-10. .
Leigh, Rowley (2003-07-01). "Messy pleasures". The Daily Telegraph.